So you probably didn’t come to the UK just for the food and drink; however with some fantastic food and drink on offer I’m sure you will change your mind. Like many countries the UK has its own traditional dishes which can be very tasty. Below are 5 dishes you just have to try when visiting the UK. Fish and Chips - Fish (cod, haddock, huss, plaice) deep fried in flour batter with chips (fried potatoes) dressed in malt vinegar. This is England's traditional take-away food. 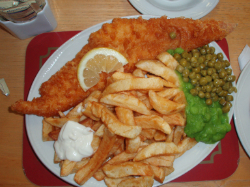 Fish and chips are not normally home cooked but bought at a fish and chip shop ("chippie" ) to eat on premises or as a "take away". Full English - Eggs, bacon, sausages, fried bread, mushrooms, baked beans all on one plate. A fantastic feast and a brilliant way to start the day. Roast Dinner – This dish is very common with UK families on a Sunday for dinner. Typical meats for roasting are joints of beef, pork, lamb or a whole chicken. You tend to have a choice of one of these meats with Yorkshire puddings, vegetables and gravy. Shepherd’s Pie – This dish is made with minced meat and mixed with a variety of vegetables before being topped with mashed potato. Bangers and Mash - Bangers are sausages in England. (The reason sausages were nicknamed bangers is that during wartime rationing they were so filled with water they often exploded when they were fried.) Having these with mash potato is very popular in the UK. The UK has its own traditional drinks as well as dishes. Please see below some very tasty drinks which you should try upon your visit to the UK. Tea – A cup of tea is a very common drink in the UK and you are probably aware of the love for tea the English have. It is estimated that the UK drink 165 million cups of tea day. You can have them with sugar, milk or just with a tea bag and hot water. Coffee - Coffee is now as popular in Britain as tea is. People either drink it with milk or have it black and either have freshly- made coffee or instant coffee. You will find a lot of full time employees drink coffee as apparently due to the caffeine it keeps you awake longer. Bitter - Britain is also well known for its ale which tends to be dark in appearance and heavier than lager. It is known as "bitter"
Wine - Britain's wine industry is growing from strength to strength and we now have over 300 wine producers. A growing number of British vineyards are now producing sparkling white wine as well as full bodied red wine. On the whole UK supermarkets are quite similar in the products they offer. You tend to find Asda, Morrisons and Aldi are the cheaper ones with Tesco and Sainsbury’s being in the middle with some fantastic offers. You tend to find Marks and Spencer, as being more expensive than the rest but there is some fantastic food on ever.